John Glenn Biography, Wife, When Did He Die And What Did He Die Of? A military pilot, astronaut, engineer, businessman, four-time senator, John Glenn was a man accustomed to trying on different caps in his lifetime. He is wildly recognized as a national hero and a dedicated compatriot who gave his service to his nation’s military, navy, marine corps, and later to the people. Without a doubt, he was one hell of a John. Perhaps you have been wanting to know more about this Glenn, well, here is your treat! Beyond his biography, learn about his wife and the circumstances surrounding his death. John Glenn, (born July 18, 1921, in Cambridge, Ohio), was the first American astronaut to orbit the earth, an astounding feat he pulled off in 1962, completing three orbits and returning successfully. Before he made history in space, he was just a small town boy who loved to fly. He became infatuated with airplanes when he was eight years old after his father paid a pilot to let them fly in one. Years later, while in college studying chemistry, he started taking flying lessons and earned his pilot’s license by July 1941. Flying did not become a career option until later that year when the Japanese bombed Pearl Harbour. John Glenn decided to drop out of college and join the Army Air Corps. He wasn’t enlisted, so, he went and signed up for the Navy where he received rigorous combat flight training and was later commissioned to join the Marines. By the time World War II ended, he had flown 59 combat missions in the Pacific. He opted to remain with the marines to train new pilots and test planes. The Korean war found him still serving the military and he was ordered to join the war effort in Korea, where he flew 63 more missions, applied for an exchange programme with the Air price, and proceeded to fly another 27 missions. Glenn received numerous awards for his service in both wars like the Distinguished Flying Cross, which was awarded to him six times, and the Air Medal with 18 clusters. Soon after the close of the wars, Glenn applied for training as a test pilot at the U.S Naval Test Pilot School, where he worked on and flew pioneer aircrafts such as the F-8 fighter. He completed “Project Bullet”, the first transcontinental flight with supersonic speed, flying from Los Angeles to New York in three hours and 23 minutes. This new speed record made him a small celebrity in America. Ever the daring pilot, Glenn welcomed a new challenge when he was selected as one of the Mercury 7 astronauts for the U.S Space Program. On February 20, 1962, he piloted the Friendship 7 spacecraft and became the first American to orbit the earth. Despite the problems that arose during the flight, like the faulty thruster that forced him to control the spacecraft manually, and a chance that the heat shield had been destroyed, which meant he would be burnt to a crisp at the point of re-entry, Glen managed to land successfully nearly 5 hours after the launch. In an instant, he became a national hero. This legend went on to retire from the space program in 1964 in pursuit of public service. He suffered a serious injury one month after announcing his intention to run for Senate and had to withdraw his candidacy to recover. In the meantime, he retired from the marine and entered the world of business as the Vice-president for domestic corporate development at Royal Crown Cola International Ltd, the soft drink company, where he later rose to president. He tried his hands at politics again in 1970 and lost at the primaries. However, he was elected a U.S Senator from Ohio in 1974 and was subsequently re-elected three times. In 1984, he tried to run for President as the Democratic candidate but was unsuccessful. Still in love with flying, Glenn returned to space in 1988, at the age of 77, becoming the oldest person to ever travel in space. John Glenn married his childhood friend and high school sweetheart Anna Margaret Castor, nicknamed Annie on April 6, 1943. Both of their parents were longtime friends so John and Annie practically shared the same crib growing up. They had two children together – John David and Carolyn Ann, born in 1945 and 1947 respectively; and two grandchildren. 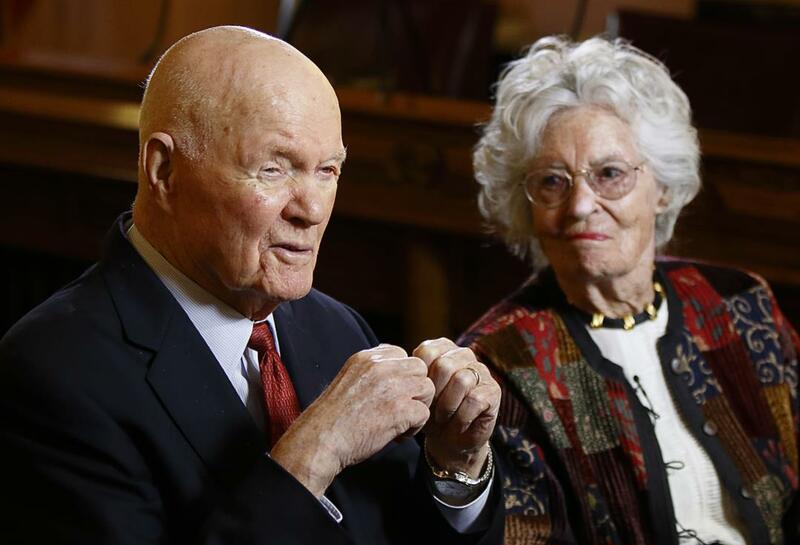 After he retired from public service, John and Annie founded the John Glenn Institute for Public Affairs at the Ohio State University – where he later became an adjunct professor of political science, to encourage young people to take an interest in public service. He and Annie remained married for 73 years until his death. When Did John Glenn Die And What Did He Die Of? John Glen was hospitalized at the James Cancer Hospital in Columbus, in early December 2016. His health had been declining for a while. With his family congregated at the hospital, Glenn passed away on December 8, 2016, right there at the medical center. The cause of his death was never disclosed; he was 95 years old and the last surviving astronaut of the Mercury 7. President Obama declared that flags were to be flown at half-mast until Glenn was buried. He received many more awards throughout his lifetime, including the Presidential Medal of Freedom.